It’s not just any old celebs who flock to the West Country. At this time of year the most important VIP of all leaves his reindeer fueling up on oats and revising aeronautical theory in preparation for Christmas Eve and heads for a refreshing West Country break. We know because we’ve seen him flashing by, a streak of red on trains, trams and boats – and now… sssssh… we’re letting you in on Santa’s secret travel itinerary for 2016. Based on the best-selling book by Chris Van Allsburg and the classic Christmas movie, this trip to the North Pole invites you to take part in the Polar Express experience by tram, travelling along the Axe estuary and through two nature reserves. Listen to and sing along with all the songs, be served hot chocolate and cookies by the dancing chefs and meet Santa and his happy bunch of elves. Each child will receive a special gift from Santa and you’re welcome to wear your pyjamas on board just like the movie! Depart by train from Paignton for a heady dose of nostalgia on a scenic return journey to Kingswear. During your journey Aladdin, Jasmin, Jafar and the Genie perform a mini pantomime to get you in the spirit to greet Father Christmas – who will visit you at your seat with his sleigh and band of merry helpers. Make sure you charm Aladdin and perhaps your wishes will come true. During your trip from Buckfastleigh to the North Pole (sometimes known as Totnes), all the children go and see Father Christmas in his wonderful grotto to collect their Christmas present and enjoy a drink and a biscuit. The grown ups aren’t forgotten: there’s a warming glass of mulled wine or a non alcoholic alternative and a mince pie for each of them.The journey takes an hour and a half to two hours. Enjoy an exciting two-mile return journey on this picturesque narrow gauge railway from Woody Bay Station to Killington Lane and back by steam train. Get into the festive spirit whilst the children experience the magic of Christmas by meeting Santa and receive an individually named present. The Mine Train will trundle you to Santa at this historic World Heritage Site. You can sit by the warm fire in his grotto, listen to a Christmas story and enjoy mulled wine and mince pies, then make a special Christmas decoration to hang on your tree in your holiday cottage. Enjoy a heritage steam train ride and see Santa in his grotto on board the train during your journey. A free bag of presents is in store from Santa for children, mince pies and seasonal refreshments for adults. Santa can’t resist a bit of nautical style. The pretty harbour town of Fowey hosts markets and entertainment from 9th to 11th November. Father Christmas makes his arrival by boat on the first evening, followed by switching on of Christmas lights and carols. On Saturday and Sunday there are Christmas markets selling gifts, crafts and local food and drink. 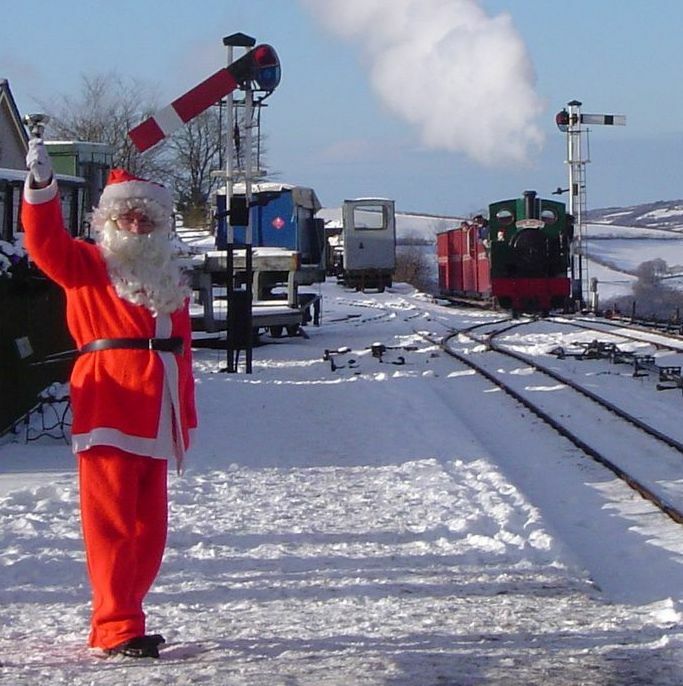 Enjoy a heritage steam train ride through glorious Somerset countryside with Santa, receive a present and chuckle at the entertainer. The Santa Express chuffs from Bishops Lydeard to Williton and return or Minehead to Williton and return, or the Santa Specials are a shorter route from Minehead to Blue Anchor and back, where you alight for the grotto. Visit Santa in his festive grotto as the train chuffs slowly through the Mendip countryside. The five mile round trip takes approximately one and a half hours, during which time, from the comfort of your seat, all the family can enjoy the splendid Mendip Hills from the old fashioned carriages and experience the unique sights, sounds and smells of a bygone age when steam was king. Departing from Poole Quay and sailing for approximately one hour and 15 minutes, this trip, designed for families with children, will take you past Brownsea Island and its famous castle built on the island by Henry VIII and the luxurious houses on Sandbanks peninsula owned by the rich and famous residents. Santa will wander through the boat, there’s fun with an entertainer and Christmas music will waft over the waves. Board the special train to meet Santa, be served refreshments by his special helpers and chortle at the entertainer on the trip back. It’s a nostalgic world that will take you back in time to days of simple pleasures as you chuff past the spectacular ruins of Corfe Castle.